I've been on a nut butter craze lately, and I've bought almost every type of nut possible within the last couple of weeks. From walnuts to almonds, peanuts to cashews, and pecans to pistachios. I even bought some raw peanuts, marcona almonds and brazil nuts. Some nuts can be expensive, so it's best to find the best deals possible. I've found that buying crumbled nuts rather than whole nuts are cheaper, and buying certain nuts (like peanuts) in the shell cost less than out of the shell. And of course, buying in bulk saves money too. That's why I bought a 3lb bag of walnuts from Costco. Oh, those silly impulse buys. BUT, that 3lb bag saved me tons of money in the end. I used to buy Artisana walnut butter (also contains cashews) which costs $11.99 per 8oz jar. That's twelve bucks for one cup of nut butter. The 3lb bag of walnuts I got from Costco has the capability of making me six cups (or 48oz) of walnut butter. 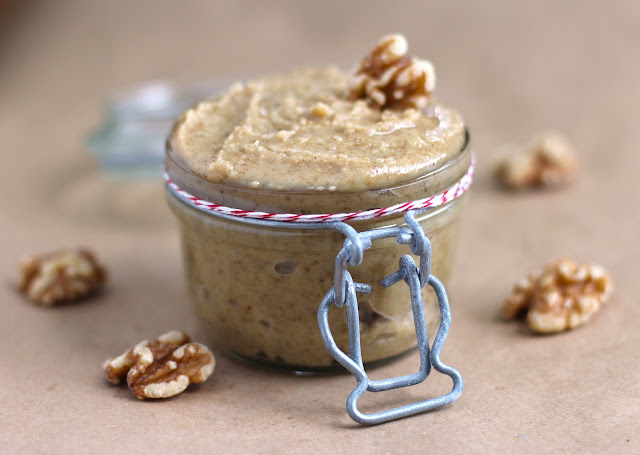 One cup of this homemade walnut butter costs only $2.99!! That's $11.99 vs $2.99 people. I can't believe I ever paid such a steep price for a tiny jar of nut butter. 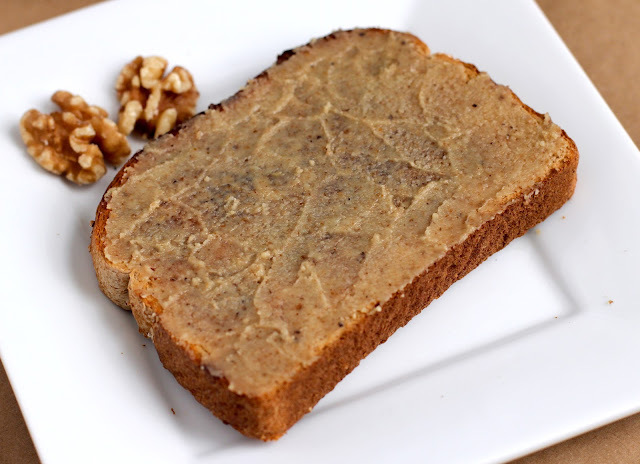 Making walnut butter at home saves nine dollars. C'mon, that's money we could be spending on important stuff. Like chocolate. 1. Pulse walnuts in a food processor until crumb-like (I used my mini food processor and pulsed about 30x). 2. Grind the nuts, scraping down the sides of the processor when necessary (I did this at 1-minute intervals. 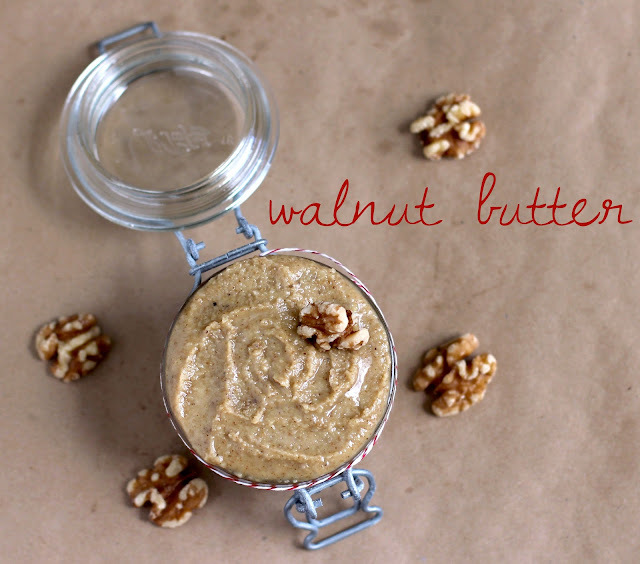 My walnuts turned into butter very quickly, in only 4 minutes!). Feel free to add salt to taste or even some stevia to sweeten. 3. Scoop the nut butter into a pretty sealable jar. Seal tightly closed and refrigerate to store. A unique nut butter to use instead of regular peanut butter! Tastes delicious on toast with a drizzle of pure maple syrup and a dash of cinnamon. Yum. I just made almond butter for the first time yesterday!! 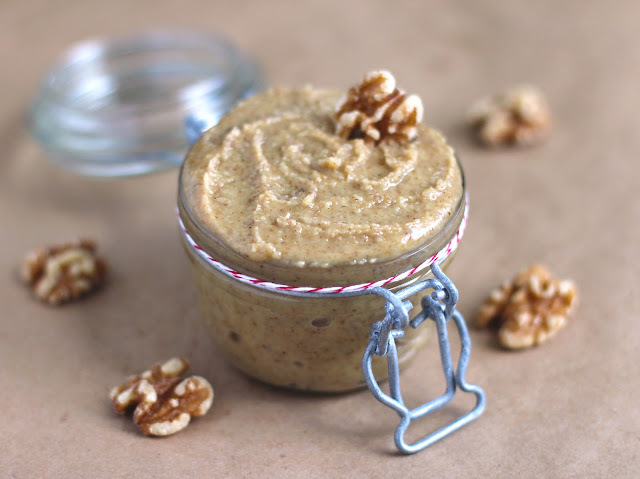 I am totally obsessed with homemade nut butters! Great idea! I buy raw almond butter all the time and have never tried making it at home. I recently made homemade cinnamon hazelnut butter. It was delicious!